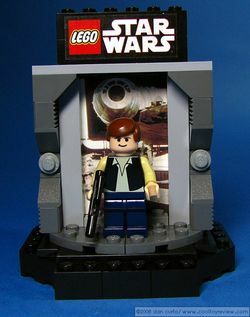 Han Solo/Indiana Jones Transformation Chamber was an exclusive set given away to guests at the LEGO 2008 Toy Fair Collectors Party on February 16, 2008. Only 100 of these sets were released. It was based upon the appearance of Harrison Ford, who plays both characters in both of the movie series. The other side of the chamber. Facts about "Han Solo/Indiana Jones Transformation Chamber"
This page was last edited on 18 August 2017, at 00:08.